It's bang up-to-date, having been revised in January 2018. 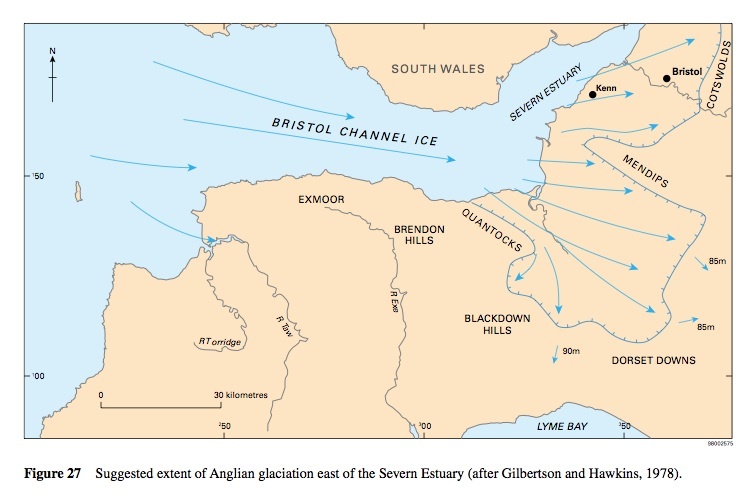 As the authors say: "Evidence in Somerset and Avon, combined with that from South Wales, for an Anglian glacier moving up the Bristol Channel has been accumulating in the last decade or so." There is no assessment here of the likely easternmost limit of the Anglian ice. The glacial deposits of the region are mostly scattered remnants and provide difficult problems of interpretation. The earliest drift deposits are represented by remanié patches of erratic pebbles of quartz, ‘Bunter’ quartzite and, less abundant, strongly patinated flint lying on the surface of or within fissures in the Cotswold plateau up to a height of 300 m above OD. On the eastern boundary of the present region and in adjacent areas to the east, there are scattered patches of sandy and clayey drift with similar erratics, which are now known collectively as the ‘Northern Drift’. The general opinion is that the deposits are heavily decalcified and probably include both tills and the fluviatile deposits derived from them. They predate organic Cromerian deposits in the Oxford area and thus provide evidence for pre-Cromerian glaciation (see summary in Bowen et al., 1986). High-level plateau deposits in the Bath-Bristol area comprise poorly sorted, loamy gravels with abundant Cretaceous flints and cherts and have been correlated with the ‘Northern Drift’. The Anglian glaciation is better represented in the district. In the Vale of Moreton there is a three-fold sequence. At the base lies the Stretton Sand, a fluviatile, cross-bedded quartz sand, which has yielded a temperate fauna including straight-tusked elephant and red deer. This was formerly dated as Hoxnian in age but now must be considered to be older. The Stretton Sand is similar to the supposedly younger Campden Tunnel Drift (see below), and it has been suggested that the temperate fauna in it is derived from an earlier interglacial deposit. The overlying Paxford Gravel, which comprises local Jurassic limestone material, has yielded mammoth remains and has an irregular erosive contact with the Stretton Sand. At the top, up to several metres of ‘Chalky Boulder Clay’ with derived ‘Bunter’ pebbles may be present. Thin red clay is locally present immediately beneath the till, possibly representing a feather-edge remnant of the glacial lake deposits of Lake Harrison. At the northern end of the Cotswolds, in the gap between Ebrington Hill and Dovers Hill, the Campden Tunnel Drift consists of well-bedded sand and gravel with ‘Bunter’ pebbles and Welsh igneous rocks, and two beds of red clay with boulders, probably a till. The deposits occupy a glacial overflow channel, up to 23 m deep, caused by the ponding of the Avon and Severn valleys by the Welsh glacier farther downstream. 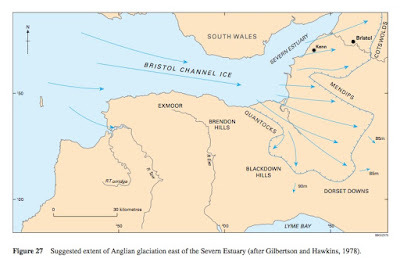 Evidence in Somerset and Avon, combined with that from South Wales, for an Anglian glacier moving up the Bristol Channel has been accumulating in the last decade or so. The construction of the M5 motorway through the Court Hill Col on the Clevedon–Failand ridge led to the discovery in the bottom of the col of a buried channel, 25 m deep and filled with glacial outwash deposits and till. Drilling has since proved similar drift-filled channels in the Swiss and Tickenham valleys crossing the same ridge. South of the ridge, and rising from beneath the Flandrian alluvium of Kenn Moor, marine, brackish and freshwater interglacial sand and silt overlying red stony and gravelly till and poorly sorted cobbly outwash material were disclosed in drainage trenches and other works. AAR results indicate that whilst the bulk of the interglacial deposits are Ipswichian in age, samples of Corbicula fluminalis from fluvial deposits directly overlying the glacial deposits give a much earlier date and suggest that the latter are Anglian in age (Andrews et al., 1984). Similar local occurrences of possible till have been reported beneath the Burtle Beds of the Somerset levels. In the light of these and other discoveries, the glacial overflow hypothesis of Harmer (1907) for the cutting of the Bristol Avon and Trym gorges has been revived to explain why these rivers cut through hard rock barriers in apparent preference to easier ways through adjacent soft rocks. Bowen, D Q, Rose, J, McCabe, A M, and Sutherland, D G. 1986. Correlation of Quaternary Glaciations in England, Ireland, Scotland and Wales. Quaternary Science Reviews, Vol. 5, 299–340. Andrews, J T, Gilbertson, D D, and Hawkins, A B. 1984. The Pleistocene succession of the Severn Estuary: a revised model based upon amino acid racemization studies. Journal of the Geological Society of London, Vol. 141, 967–974. Harmer, F W. 1907. On the origin of certain canon-like valleys associated with lake-like areas of depression. Quarterly Journal of the Geological Society of London, Vol. 63, 470–514. A long house on Waun Mawn? Waun Mawn -- destroyed ring cairns?